Beiersdorf (Thailand) Co., Ltd. a company operating within the FMCG (Fast Moving Consumer Goods) industry sector and manufacturing across various branded goods categories including skin care, personal care and derma-cosmetic skin care, awarded Christiani & Nielsen (Thai) Public Company Limited the site preparation works for new production facilities. The project is located in Bangplee Industrial Estate, Samut Prakarn province. Guardian Industries Corp Ltd., leading global glass manufacturer with cross-industry capabilities, as a leader in float glass, fabricated glass products, fiberglass insulation and other building materials for commercial, residential and automotive applications, awarded Christiani & Nielsen (Thai) Public Company Limited a contract of construction for new 1-storey factory. The scope of work comprises of the Structural, Architectural and M&E works with a total floor area 6,700 m2. The project is located in Hemaraj Saraburi Industrial Estate, Saraburi province. Mahidol University, currently ranked 1st in Thailand according to the “Webometrics Ranking of World Universities”, recently awarded us a contract for the construction of the Structural, Architectural and MEP works of a three-storey and two basement parking building with approximately 30,194 m2 of total floor area. The project is located at Mahidol University, Salaya Campus, Nakhon Pathom province. External works for a 4-storey Delicatessen Food Factory with a single basement. The project consists of a total floor area of 24,500 m2 and is located in Lat Lum Kaeo, Pathum Thani province. technology in Rayong, Thailand, with an emphasis on knowledge discovery and interdisciplinary cutting-edge research, has awarded Christiani & Nielsen (Thai) Public Company Limited the MEP works for two 3-storey Education Buildings. The Institute is located in Wangchan District, Rayong. Rayong. The scope of works comprises of Structural, Architectural, and External works with an approximate total floor area of 5,623 m2. CPRAM Company Limited, a subsidiary of Charoen Pokphand Group (CP Group), awarded Christiani & Nielsen (Thai) Public Company Limited the construction of the Structural, Architectural and External works for the Delicatessen Food Factory consisting of 9 buildings and relevant facilities with an approximate total floor area of 28,000 m2. The project is located in Surat Thani province. Marubeni Corporation Co., Ltd., awarded us a contract for the construction of the Civil, Structural, Architectural and External works comprising of the Cooling tower, Pipe Bridge, Building, Trench and other utilities. These will be installed at the 650 MW x 2 combined cycle power plant and replace the existing South Bangkok Power Plant in Samut Prakan Province. Kamnoetvidya Science Academy (KVIS), supported by the RASA foundation with an endowment fund provided by the PTT Group of Companies to ensure sustainability, prosperity, and longevity of the academy, awarded us a contract for the construction of the Structural, Architectural, MEP works of a one storey Multi-purpose sports hall with approximately 1,374m2 of total floor area. The project is located in Rayong province. Structural, Architectural, M&E and External works with a total floor area approximately 12,000 m2. 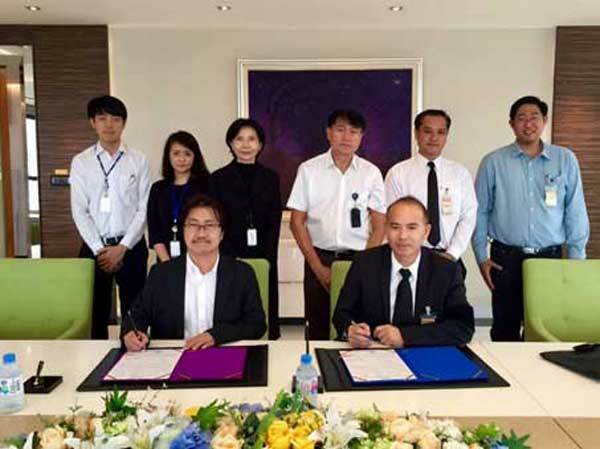 and Christiani & Nielsen (Thai) Public Company Limited (CNT) for the construction of 3-storey of 2 Education Buildings took place on June 22, 2017. The scope of works comprises of Structural, Architectural, and hard scape works totaling approximately 11,088 sq.m. of floor area. The project is located in Wangchan District, Rayong. Project Director (3rd right) and VISTEC Team (1st and 2nd left). Representing CNT were Mr. Pichet Nimpanich, Business Development Director (Sitting right), Mr. Werachat Chinnapong, Senior Manager – Business Development (2nd right), and Mr. Piyachard Bothidaht, Business Development Manager, (1st right). 3-storey for 2 Education Buildings located in Wangchan District, Rayong, Thailand. 11,088 m2. of floor area. totaling approximately 24,000 m2 of floor area. The project is located in Nakhon Ratchasima province. Thai Union Manufacturing Co., Ltd., a global leader in the seafood industry, awarded Christiani & Nielsen (Thai) Public Company Limited the construction of a 3-storey Fish Oil Extraction Plant located in Samut Sakhon. The scope of works comprises of Structural and Architectural works, an underground water tank as well as road pavement and drainage works. CPRAM Company Limited, a subsidiary of Charoen Pokphand Group (CP Group), has awarded Christiani & Nielsen (Thai) Public Company Limited the Piling works for CPRAM Bo Ngoen Phase 2 in Lat Lum Kaew, Pathumthani. The project scope consists of the supply and installation of approximately 500 pre-augured spun piles. Donmuang Pattana Co., Ltd., the owner of one of the main markets for fruits and vegetables in the central region, awarded Christiani & Nielsen (Thai) Public Company Limited an additional contract consisting of road pavement work in an area of approximately 9 rai as part of the wholesale market located in Pathum Thani province that is currently being built.